Parks are often preservationists’ first line of defense against sprawl. To many, they’re a win-win arrangement—less rambling development and more open space. But the same qualities that make them attractive to planners—higher property values, more recreational opportunities, and pleasing aesthetics—also draws new residents, undermining their sprawl-fighting virtues. Greater London and the San Francisco Bay Area are good examples of the failure of greenbelts to stem outward expansion and encourage upward growth. Regional parks surrounding the core metropolitan area have become assets for communities outside the belt, attracting residents. So long as people have an expedient way to get to work, they’ll happily sacrifice proximity to work for a little patch of sunshine and greenery they can easily visit. 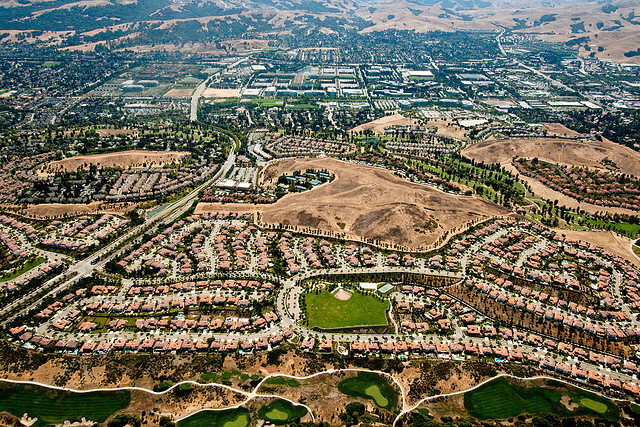 That’s the mechanism behind suburbs that leapfrog parks and greenbelts, according to two resource economists. They created sophisticated models that produced simplified SimCity maps that allowed them to see how parks of different sizes and shapes could change development patterns. Without parks, cities appeared as perfect circles on the map, with the highest density areas in the middle. The addition of a park, however, drew people away from downtown, creating a second locus of high-density development around it much the same way Central Park has attracted Manhattanites. But they found that if New York had an attractive space like Central Park outside of city limits, its population would be smeared across the landscape like butter on bread rather than centered on Manhattan like a dollop of ice cream. Typical parks with low perimeter-to-area ratios tend to affect development this way. Greenbelts on the other hand have gobs of perimeter, making them easy to access for large numbers of people. The perimeter-to-area difference between classic parks and greenbelts means they have different effects on development, at least within the confines of the paper’s model. Where classic parks spread development by acting as a second downtown, greenbelts that bound a city can hem it in. By diffusing a park’s benefits around the city rather than concentrating it in one place, greenbelts’ recreational values are typically lower than a classic park but accessible to more people. People want to live close to both open space and their jobs, so a properly configured greenbelt can boost neighborhood density between itself and downtown, limiting sprawl. For greenbelts to be truly effective, the paper’s authors note, they must be sufficiently wide to discourage casual commuters from living outside its bounds. This is likely why greenbelts around cities like London and San Francisco have failed—they just weren’t big enough. Furthermore, while greenbelts can keep development inwardly focused, new parks within city limits can spur redevelopment of underpopulated areas. Together, they could be a powerful double whammy against sprawl. Whatever the case, it’s clear that cities’ open-space strategies need to be well though out. Poorly planned park systems can have consequences that are not just unintended, but counterproductive.